With the hot weather we´ve been having, the desire to cook has been low. But…a girl and her Big Man have to eat, so the other night we decided on some grilled langoustines with some vegetable fried rice to accompany it. Fried rice is an alien concept to most Spaniards, so Big Man had visions of me deep frying individual grains of rice or making some sort of croquette. To his relief, and mine (due to the heat), it was a simple dish with only the smallest amount of oil and frying involved. I boiled some rice (I used brown, but the choice is yours). While this was cooking I fried a finely chopped onion and two crushed cloves of garlic in a very small amount of oil in a non stick pan until it started to look brown at the edges. Then I added finely chopped courgette and a long thin green pepper and continued to stir fry them. In a separate pan I made the thinnest omelette known to man! Whisk one egg and pour into a lightly oiled pan- almost as if you were making a crêpe – and make a very thin omelette. Flip it over to get both sides lightly browned and slide onto a plate to cool a little. When the rice is cooked, drain well and add to the vegetables. There´s no need to add more oil if you have a good pan as you will now almost dry fry it. Season with salt and pepper and every few minutes give it a stir until the rice starts to brown. Are those prawns ready yet?! Roll up the world´s thinnest omelette and cut it into fine shreds. Sprinkle these eggy shreds over the top of your rice, mix gently and serve. this sounds perfect for the prawns and something I have never tried before! A sort of mediterranean/Chinese mix! That looks delicious and must have been just right with the langoustines. This hot weather leads to invention, dishes that don’t add too much to the heat! I’ll be sorry when summer’s over, but even so will enjoy making stews and roasted dishes again. It was a good combination. I know what you mean – I´ll miss the summer as I like the heat, but am looking forward to autumn and a change in food and cooking style. Well thank you very much for your kind words! Glad you liked what you saw and hope you come back again soon to visit again. 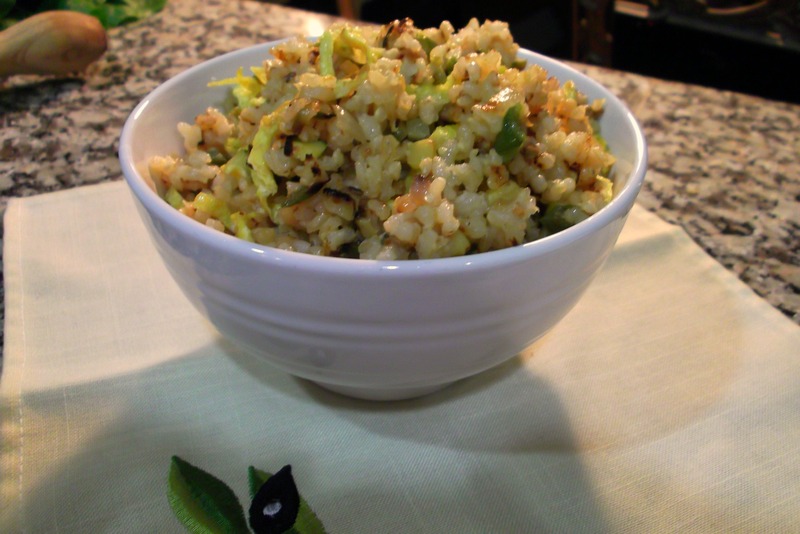 LOVE fried rice but hardly ever make it – not one of Pete’s favourites – think I should revisit the idea! Yours looks delicious. That made me feel hungry – I’ve got a craving for soy sauce now. …and a dollop of chili sauce! Hi Chica. Love fried rice but very rarely make it. This looks so yummy. Will be making this for supper tonight. Thanks for sharing. I´ll be over for supper then! I always get so inspired by the many posts I read and this one sparked my interest to make fried rice! I definitely didn’t have this growing up in an Italian family! But I love your healthy version and a great weeknight meal! We didn´t get to eat it very often either – maybe on special occasions when Papá went out for a Chinese takeaway! Can recommend it, even without anything on the side it´s great. Oh well, a good reason to make more rice! What a great dinner! I would’ve liked to eaten the thinnest omelette known to man too. I did find myself thinking “if I used a really, really big pan I could make this even thinner”! You’re right. This would make a tasty meal on one of those too-hot-to-cook days. And i isn;t that hard to make. I don’t know why I only have it when I order Chinese food. I hope this post spurs me into trying to make it for myself. I only ever used to order it…but now the nearest chinese restaurant is a two hour round trip away…! It doesn´t matter too much if you over cook it to start with as it will dry out in the frying! This looks yummy! I love fried rice! Seems like a lot of people do but we rarely make it…hopefully more of us will be giving it a go again! ¡Mmmm! qué pinta tan buena. Esta receta seguro que la hago muy pronto, a mis niños les encanta el arroz tres delicias y este promete ser la bomba! Same here…can´t remember the last time I made it (before this one) and I don´t know why as it´s so easy! It is also been so hot in Rome!! 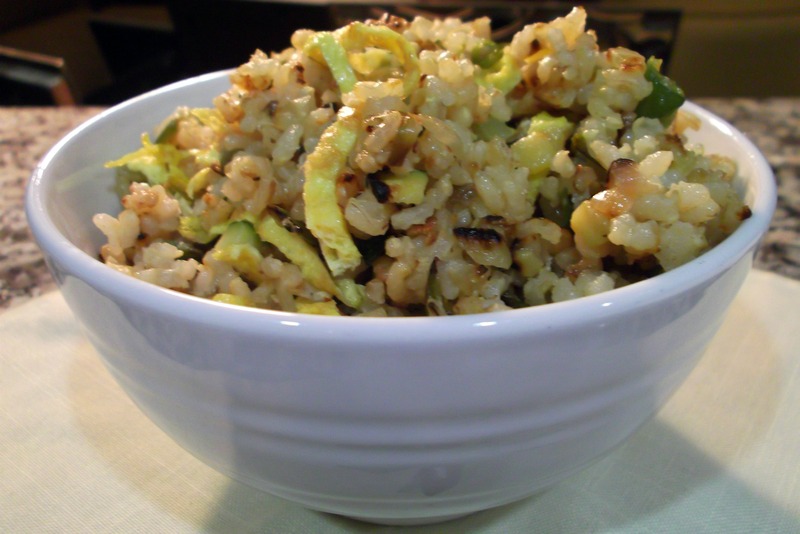 I totally love this recipe, specially the fact you used brown rice. It certainly makes the dish richer!! The courgette and green peppers just add that freshness to balance the dish!! Simply delicious!!! Brava!!! Am trying to use more brown rice as I know it´s good for us! Rice is such a great dish to serve with seafood. I think it was so funny about what Big Man’s vision of fried rice would be. I also like it cold the next day – or is that just because I am a bit weird? !